← Wow, what a grand idea, with or without the popsickle stick. Enjoy! Wine clubs aren’t a bad way to try new wines if you’re in an out-of-the-mainstream location (as we are in Ocala, FL) where tastings don’t happen often, especially if you have a friend who will share the cost with you, and double the fun and education by tasting together. This wine is available through the Wall Street Journal wine club, or by the bottle or case from WSJ or Zagat. Wineries often offer club memberships, too. With a slightly floral fragrance and bright, mouth-watering fruits (plum, a little cherry and raspberry) on the nose and palate, this dark, tasty red wine blend had a touch of smoky oak, a hint of pepper and spice, a silky mouth-feel, and a moderately long finish. Approachable, straightforward and pleasing, it was enjoyable by itself; WSJ suggests pairing it with barbecue. LABEL NOTES: My family has been making wine for four generations. Thanks to their passion and to the sense of responsibility they engendered, I inherited a love of Dão wines and became a winemaker. I selected our very best traditional grape varieties for this wine: Touriga-Nacional from our Estate chosen for its ripe floral character and Tinta Roriz and Jaen for their fruit and spice. This wine has a wonderful natural freshness, with floral highlights and a succulent, ripe red fruit palate. Elegant tannins make this wine very easy to drink and help to provide a long, fruity finish to the wine. AWARD: Bronze, 2011 Decanter World Wine Awards. 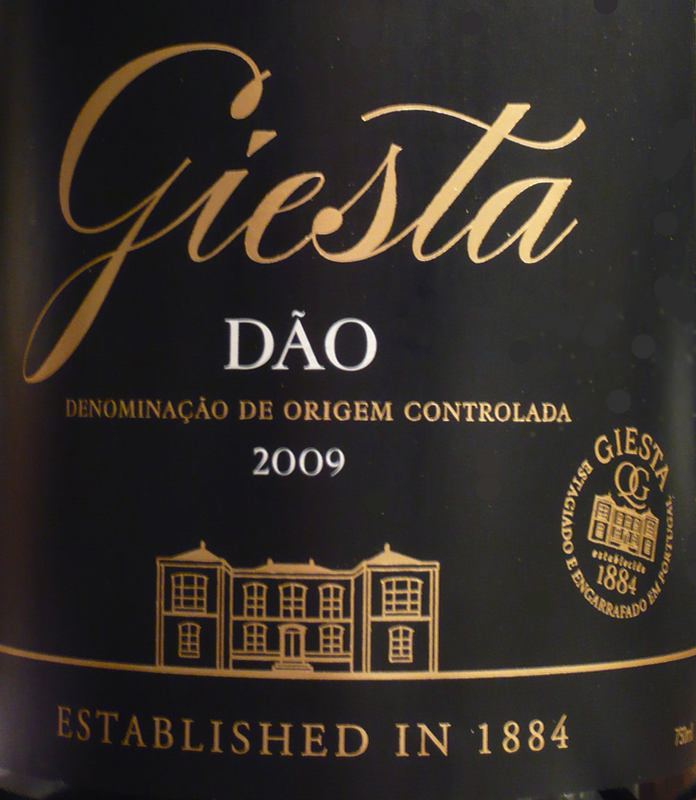 The Quinta da Giesta winery was established in 1884. This entry was posted in Jaen, Portugal, Tempranillo, Touriga Nacional. Bookmark the permalink.